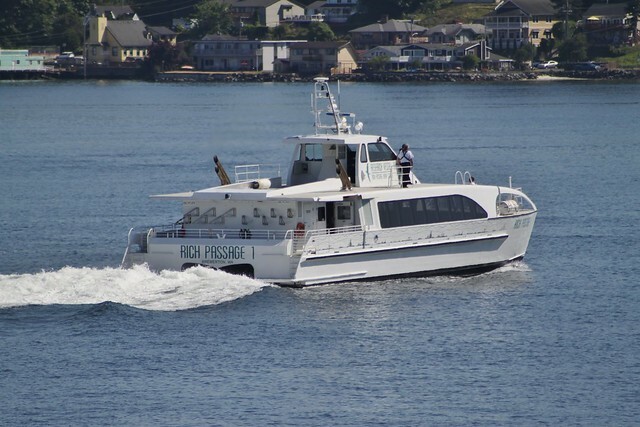 Kitsap Transit is about to launch their passenger-only “fast ferry” service between Bremerton and Pier 50 in Seattle on Monday, after a decade-long saga of lawsuits, studies, funding crises, and ballot measures. The Rich Passage 1, built in 2010 in Bellingham, will make six daily round-trips between the two cities on weekdays (during peak periods), and ten daily round-trips on Saturdays (mostly in the afternoons). Kitsap Transit will continue to not offer Sunday service, including onboard the new ferry. Currently, the state-operated car-and-passenger ferry takes 60 minutes to make the trip across Puget Sound, running roughly every 60 to 90 minutes. The new fast ferry will take just 28 minutes, with 7 minutes for loading and unloading at each terminal before turning around. The stark difference in travel time come in part due to a lightweight composite body, as well as being able to run at upwards of 37 knots (43 mph) and cruise at 29 knots (33.4 mph); the newest state ferry, the MV Chimacum, only has a top speed of 17 knots (20 mph), about the same as the average surface-level light rail system. The Rich Passage 1 will be able to carry a total of 118 seated passengers, and has room for four mobility devices (that have to be tied down) and 12 bicycles. Up to 88 of those seats can be reserved in advance using Kitsap Transit’s online booking system, while the rest are available for walk-on passengers on a first-come, first-served basis; un-claimed reservations may also be released if not claimed within 10 minutes of boarding. The fares, paid via cash or ORCA, come out to $2 for eastbound (Bremerton to Seattle) trips and $10 for eastbound (Seattle to Bremerton) trips, mimicking the state ferries’s cheap (aka free) fare for eastbound trips. Fares will be free until July 31 in celebration of the new service, so a day trip to Bremerton may be well in the reach for those who haven’t visited before (myself included). The vessel itself is a bit small and cramped, especially compared to the colossal state ferries. The seats are packed densely, with only room for a single table and a handful of power outlets. At the back of the boat are 12 bicycle racks that are unable to fit bicycles with fenders, disc bakes, or fat tires, much to the ire of cyclists more used to the roomy King County Water Taxi accommodations. As a consolation, the state ferries will still accept bicycles of all kinds, though both they and the new fast ferry ban cleats on board the passenger deck. To help spread the fast ferry’s reach across the county, Kitsap Transit also launched two express bus routes timed to ferry arrivals and departures. Route 1 travels to Silverdale Transit Center and North Viking Transit Center in Poulsbo via Highway 3; Route 2 travels through East Bremerton and eastern Silverdale, serving several park-and-rides. The ferry departs from the same series of docks as the Port Orchard and Annapolis foot ferries, below the passenger terminal for the state ferries, accessible via a stairway and elevator from the bus platform. The launch of a passenger-only ferry service to Bremerton may be triggering some déjà vu for some long time residents. Indeed, the idea is not new at all—the old Mosquito Fleet used to make the run regularly in the late 1800s—but it has had trouble staying afloat. Washington State Ferries (WSF) rolled out a passenger-only ferry service in 1986, buying a used Alaskan tour boat that made the run in 38 minutes and topped out at 25 knots (29 mph). While early runs were fairly empty, the ferry steadily grew to 22,000 monthly riders by May 1989, allowing WSF to build two new passenger ferries to serve Vashon Island. Only a month later, a dispute between the state legislature and governor’s office led to the suspension of service. The boats sat unused for a few months, until they were loaned to San Francisco after the October 1989 Loma Prieta earthquake. A new funding source for the ferries was found and, by late April, the three ferries were plying the waters of Puget Sound once more. Only months later, however, complaints from residents along Rich Passage, a narrow strait on the south side of Bainbridge Island, convinced the state to slow the boats down to 12 knots (14 mph), bringing the total travel time to 50 minutes, only a hair faster than the car ferry. The Rich Passage homeowners claimed that the wake generated by the high-speed ferries were damaging their beaches and bulkheads, asking the state for a thorough investigation; the area had previously complained of damaging wakes from newer car ferries in the late 1980s, and the WSF obliged by also slowing them down. The WSF study concluded that the damage was minimal, but the existing vessels would be a problem long-term, so the state commissioned a high-tech passenger ferry that would offer an environmentally-friendly answer to the Rich Passage problem. The new ferry, the MV Chinook, launched to great acclaim in 1998, running at a speed of 34 knots (18 mph) or higher with a smaller wake, thanks to a lightweight body and specially-designed water-jet engines. 113 of the Rich Passage homeowners, however, were not pleased and filed a class-action lawsuit the following year. The Chinook was slowed to 12 knots (14 mph) through the Rich Passage after an injunction from the King County Superior Court, which was overturned and lifted by the state supreme court the following year. WSF themselves brought the slower speeds back in October 2001, concluding that the ferries were causing beach erosion and other environmental damage around Rich Passage. The Rich Passage homeowners settled with the WSF in April 2002, accepting $4.5 million in damages and a speed limit of 16 knots (18 mph), giving Bremerton riders a 40-minute passenger ferry trip. With the lawsuit settled, it seemed that passenger service would be allowed to continue, although at a slower pace. This would, however, not be the happy ending that Bremerton commuters and the state wanted. Only a few years prior, an activist hailing from another ferry town passed Initiative 695, capping car tabs to $30 and jeopardizing some of the ferry system’s budget. Although it was declared invalid by the state supreme court, actions by the state legislature left WSF with a $93 million shortfall. They went to the ballot with Referendum 51, promising terminal upgrades and preserving existing service (including the passenger ferries), but voters rejected it with a resounding, 60 percent no. With 5 percent of its budget cut, the passenger-only run from Bremerton to Seattle was eliminated in September 2003; the Vashon run would continue with emergency funding and later be scooped up by King County as part of their water taxi service. The Chinook and her sister vessel Snohomish would go on to be auctioned on eBay before being picked up by Golden Gate Ferries in San Francisco. Seeking to restore service, Kitsap Transit stepped in to propose a 0.3 percent local sales tax to fund passenger ferry service in 2003. While voters rejected the sales tax, Kitsap Transit partnered with a private company to launch passenger-only service in 2004 using local and federal grants; even with the transit agency picking up the costs for fuel and docking fees, the service struggled to turn a profit for its operator. Another ballot measure was floated in 2007 and again rejected by voters, leading Kitsap Transit to pull its funding; the private operator suspended service only two months after the election, leaving Bremerton once again without passenger-only ferry service. Kitsap Transit took over the state’s wake studies in 2005 and, a few years later, commissioned a new “hydrofoil-assisted” catamaran made for high speed, low wake operations. The catamaran, named Rich Passage 1 for the strait, was designed using computer models and other techniques that would “solve the problem with Rich Passage“, allowing for speeds of 37 knots through the strait. The Rich Passage 1 was put into service in 2012 as a pilot, creating a noticeably smaller wake but unable to attract many riders due to the lack of monthly passes. The Rich Passage 1 was sent to Port Townsend for storage, not before running aground and catching fire while waiting on voters to approve a subsidy for passenger-only ferry service. The fast ferries service is funded by a 0.3 percent sales tax within Kitsap Transit’s district, approved by voters last November. With $50 million in bonds eventually available to fund the system, which will operate with the goal of a 28% farebox recovery rate and without much in the way of federal grants, Kitsap Transit’s plans to expand service to Kingston (a 33-minute ride) and Southworth (a 23-minute ride) by 2018 and 2020, respectively, while also adding additional boats to the Bremerton run, may seem ambitious. The Bremerton ferry is certainly popular enough with commuters and tourists today, carrying 2.1 million foot passengers in 2016, but time will tell if this service finally catches on and is able to stand the test of time. During a 20-minute cruise aboard Rich Passage 1 on Wednesday, members of the press and representatives from Kitsap Transit and local governments were treated to a smooth, fast ride around the eponymous Rich Passage and within view of the Seattle skyline. Holding conversations, however, was not easy over the roar of the engines, made worse by the open doors on both ends of the boat. In my opinion, the fast ferries should be a nice ride for commuters that want to get to and from Seattle quicker, but occasional visitors are better off using the slower car ferries, with their large, spacious sun decks fit for snapping photos and enjoying the sea breeze—something hard to appreciate from a sealed cabin. A few weeks ago, I had the experience of riding a hydrofoil in St. Petersburg, which looks similar to the Seattle->Bremerton fast ferry, and rode a route of similar distance. While it did have a wake much narrower than an ordinary ship, it was relatively cramped, and the small outdoor deck that did exist was virtually unusable, due to the deafening roar of the engines (which were still loud, but bearable, inside the vessel). We’ll see how it goes. My understanding is that, the operating subsidy is quite substantial, even if the boat does fill up. If this is correct, expect to see serious cutbacks in service at the next recession. St Petersburg, Russia or Florida? Did you notice anything else about the transit or current situation there? My biggest beef is that the Kitsap transit director pitched this as relieving traffic which transit has accomplished on it’s own….never. On the other hand, it was also pitched as supporting growth and development. Guess what that brings? A passenger ferry won’t be bringing over additional cars during peak periods, at the very least. Bremerton could use more attention and a faster link to Seattle, as the downtown has some vacant storefronts and underutilized land (e.g. parking lots and parking garages all over). Well, in this case, if the development and growth is within walking distance of the foot ferry — and it lasts — there will be no traffic, will there? As Bruce pointed out, there is lots of underutilized (e.g. “cheap”) land withing that walkshed. Sorry, dude, your backwater 1950’s city is finally growing up. It’s the last place within a 40 minute transit ride of downtown Seattle that isn’t already $400K for a convenient place to live. Bremerton is one thing. Have you looked at zoning and allowed density in Kingston or southworth? Have you spent much time in Silverdale? Any explanation as to why there are fewer trips on weekdays than weekends? Is there a capacity problem at Coleman Dock? The fast ferry will replace some Saturday afternoon trips that the car ferries used to operate, I believe. Once Kitsap has their three boats in the Bremerton run by 2022, all day service might be possible. Tempting to say the comparison with light rail is silly. Until the floating bridge to Bremerton opens. But until anything can move express speed on I-90 again…didn’t Lake Washington once have boat service? Kirkland? Medina? Mercer Island? Seward Park? Madrona? Madison Park? Fremont? South Lake Union? UW STADIUM? Seriously, thanks for the idea, especially last port. Really could match light rail speed Kirkland to Westlake. Call them MV 540 and MV 545. Kirkland to Madison Park, and Bellevue to Madison Park. I don’t know about the others. In Kirkland at Lake Street & Kirkland Ave there’s an old ferry schedule sign. It shows half-hourly service. The road now goes one block to the dock and at the end of the pier the Argosy tour boat, but that’s where the ferry launched from. There’s a park next to it, right in downtown Kirkland. Some Eastsiders consider it their favorite place to go. Not rhetorically: What would we have to do to get a landing at UW Stadium? It seems like the passenger demand would merit some much larger boats. Like the other “I-5 ROOSTERTAILS” Everett/Seattle/Tacoma/Olympia. Combined with Sounder extended ten minutes or so south to OIympia, number of passengers who no longer have to care about I-5 might make WSDOT improve it faster. Could also do races for SeaFair! Convince UW it will benefit them and then they’ll do it. But if it mainly brings non-UW people, they won’t see how it benefits their mission. Most of the time, for most destination pairs, buses will be better. That’s the case for most West Seattle-downtown trips. For a few really specific trips the boat cuts off enough distance to be worth using, but the ability to travel inland is a huge advantage for buses! I am 100% with the idea of cross-lake-washington boats, especially with a UW stadium/dock/station. but just as an FYI, if you start looking at maps (charts) and calculating travel times, remember that the ship canal, starting at Webster Point (south of Laurelhurst) has a speed limit of 7 kts. So if you had a 30 kt speedster like RICH PASSAGE I it’d cover the 3 miles from Kirkland to Webster Point in 6 minutes, but then would take almost 9 minutes for that final mile to a stadium drop-off dock. It still means Kirkland to UW stadium in under 20 minutes –which would rock!– just don’t go measuring the mileage and thinking that could be done in less than 10…..
other routes could be done at speed though, i.e. Kirkland –> Sand Point could be a 5 minute hop ! Yeah the light rail comparison is absurd. But then again, I hear a former Bremerton mayor works for Sound Transit. A premium ferry with no Sunday service? The schedule matches the port orchard water taxi, but seems to be seriously missing the point. Someone in the ferry service thinks tourists only drive? The whole transit system is shutdown, with 28% fare box recovery, this is a $$$ choice well spent. What’s fare box recovery for all three of our Interstates combined? Let’s use old coin fareboxes, just to make it look like more. It’s for residents, not tourists. Residents are paying the taxes. Everywhere in the west sound the best transit is peak hours, some midday, maybe some Saturday, but Sunday has little or no service. If you don’t have a car you’re supposed to wait till the next Monday to go anywhere. The car ferry still runs on Sundays and will likely take the lion’s share of tourist use anyway (given how it’s advertised and how well it’s equipped to handle loads of photo-snapping visitors on the sun deck). Kitsap Transit would not be pleasing its voters by putting Sunday service on the fast ferries before the bus network. The boat is really cramped and uncomfortable. Commuters will put up with it, but tourists would have more fun sticking with state ferries. Campaign and politicians were bought by Bremerton development interests. Public pays, they profit. It doesn’t scale, well at all, and they just spent about 4 years of operating costs (needed for the $40 -$70 RT subsidies) on capital costs they promised the voters would be paid by the feds. I can’t see how this will last more than 4 years without having to go back to the voters for more money. Bremerton makes sense, but there’s only sparse one way demand from Kingston and southworth. Fuel for Kingston run makes that route the least likely to endure. But, if it succeeds, Bremerton won’t be an affordable place anymore and the west sound auto sprawl can continue. You’re right about Kingston. It simply doesn’t make sense. The walkshed is much smaller in Kingston, with less empty space in it, and the all-day parking is already full. There’s no “hinterland” to run buses through. It’s a bad idea, but Bremerton foot-ferries are not. Richard, since the Trio went big-time in 1963, Kingston just hasn’t been itself, even though the streets are still full dancing girls with wonderful Scots-Irish accents and baskets of rice and fish on their heads, and the rum is fine any time of year. Same with espresso, at that little place at the foot of the ferry ramp. I think it’s same cultural miscommunication that leaves a lot of residents walking down the road with a 3/8″ socket wrench from True Value hardware stuck in their belts. Though use them on a lug-bolt and you’ll slash a tire. Sad to say, “The Rain falling daily on the Mountain Top” doesn’t lower the heart or turn the head of an outward bound Jamaican sailor. So you’re right. Foot ferries just are useless in a head-wind. There are still girls with rice and fish? That’s like when people ask if there are still bears in St Petersburg. There are some buses that go to Kingston. However, transit from there to Seattle is an undertaking if the trip doesn’t coincide with Sounder. It’s about a 2 1/2 hour trip using the state ferry and buses, but during the Kingston SoundRunner ferry service it was less than an hour. I just finished living in Kingston for 8 years. There is free and paid parking all over Kingston and just at the far edge of Kingston there is a park and ride behind the Albertsons with bus service to the ferry. There are other park and rides distributed throughout the county that also have bus service to the ferries. One of my favorite places was at Bayside Church. I could of taken the bus from there to the ferry but the walk wasn’t that long and I was never turned away because the lot was full. But I will admit that if you have a 9-5 style job across the water with further commute to go on the other side you needed to be at these parking spaces at 0-dark-thirty to make it to work on time so I rarely saw Kingston by late morning. For those asking if Kingston has money the answer is not really. Kingston is not a city and has no city-style government. Services such as fire and police come from the county. It is a census designated place. The former Kingston Lumber site was for sale when I left and may still be. I thought it would make a great place for a rental car company to help out some of the tourists waiting 2-3 hours to board their vehicles on the ferry each way on summer weekends. That property would also make a decent spot for an additional park and ride. The parking lot was already paved and the lumber yard moved because the buildings were in too poor condition to refurbish while simultaneously continuing to run the business. I don’t think even the Kingston ferry supporters think there is a walkshed to support a foot ferry – it’s all about parking & bus service. Kingston is really an option for people in norther Kitsap that currently drive or ride the bus to catch the Bremerton or Bainbridge ferries. There’s a lot of traffic that drives into Bainbridge just to catch the ferry, and I think both Islanders & non-Islanders will be happy to not need to drive into Bainbridge just to catch a ferry to Seattle. Based on what Bruce has written here, it seems like Kitsap understands the need for dedicated routes that feed the ferries. Considering what home prices are doing in Seattle, no chance that in four years there’ll be enough ferry-positive voters to leave the decks awash on the Queen Mary, as well as happily pay whatever tax is necessary not to join the waves of unvetted terrorist refugees in permanent flight? When the New Bremertonians buy the Queen Mary and smack that champagne bottle across her bow, and her launching turns the Deep Bore Tunnel into a storm drain. And turns Melrose or Belmont into the beachfront run for the Route 14? Right now Bremerton is the exact kind of weird place you’d expect from a former industrial town restored to booming health by a convention center. Well that’s what convention centers do, isn’t it? Boarding last ferry ride to Seattle, escaped mental patient gave me choice of putting my cell phone away or getting it smacked out of my hand. My preferred choice of finding somebody in uniform with a Glock or a butterfly net got me information that guards were all directing traffic. Boarded last minute, whereupon Coast Guard asked me how I felt about people on cell phones all the time. But seriously think that if the sequel to 2008 doesn’t happen before service starts, same dynamic as for housing could bring the place an actual economy. Even if Kim Jong Un never yells “Tora! Tora! Tora!” there could be burgeoning demand for both butterfly nets and shockproof cell phones. … the all-day parking is already full. If the all-day parking is already full, then there must be some demand. Perhaps demand is pretty high, but the lack of parking is putting a damper on it. 1) Does the county (or city) have enough money to pay for good bus service and the satellite park and rides? 2) Are there enough potential riders to make this work? The parking lot is full, but maybe if you made it much bigger, you still wouldn’t get that many riders. When you ask them to take a shuttle bus, maybe you lose some people as well. The entire North Kitsap area (as defined by the school district) is 45,000 people, but many of them would be better off taking a different ferry. For example, from the southern end of Poulsbo, it is faster to get to the Bainbridge ferry, where the ferry is a lot more frequent and much faster. OK, not faster, but takes less time to get you to Seattle. Kingston itself has only around 2,000 people, while Indianola has 3,500. My guess is there are only about 10,000 people that would find it more convenient to go to the Kingston Ferry dock. These boats aren’t that big, but I, too have my doubts as to whether that is enough people to fill them. I guess we will find out in a few years. A corollary is, shouldn’t these things be planned together? A ferry and non-car access to the ferry from all the areas it’s intended to serve. @Mike — Yes, they should. Just like light rail and bus service should be planned together. But if not, you muddle along as best you can. In this case, it sounds like there is a fair amount of existing infrastructure (as RobC says above) to handle an increase in park and ride users (including those who take shuttle buses). As it is, these ferries are pretty small. If they can’t fill them up, then my guess is the lack of supporting infrastructure isn’t the problem, but lack of people who want to use it is. I don’t think that will happen in Bremerton, but could easily happen in Kingston. Great writing. I think this is your best work all around. Happy to continue to support STB. I’m excited to try this out for the Bremerton Beer festival next Saturday. 1) Vallejo and North Bay in general have a lot more people. Population density is higher and moderate density areas cove a much bigger area. San Fransisco itself employs more people as well. 2) The transit alternatives are different. Vallejo doesn’t run a car ferry. You have to take a bus into town (or take a bus to BART) when the ferry isn’t running. 3) The Vallejo ferry runs a lot more often (15 times a day). 4) The Vallejo ferry takes a lot longer to get there. It is about an hour, instead of a half hour. The distances are greater. If they ran a high speed ferry from Tacoma to Seattle, that would be very similar to the Vallejo Ferry. 5) There isn’t much of a geographic advantage for the Vallejo Ferry (again, similar to hypothetical Tacoma ferry). Without traffic, driving is faster in Vallejo. In Bremerton, it is a very long way to drive around and is never faster. The main advantage Vallejo has is density. I think the other advantage of the Bay Area system is the overall redundancy and frequency. There are a lot of passenger ferries, and if you miss the last one, you can take BART and catch a bus, which runs a lot more often than either Bremerton ferry. But Bremerton has the edge in that at least the last (slow) ferry runs later. I am not thrilled with the schedule of the Fast Bremerton Ferry. The only morning ferry that would be the least bit attractive to me is the 8:00. That gets into Seattle around 8:30, which is great if I work downtown. But what if I work in Bellevue or Fremont? Connecting bus service is fine, but that means i would have a tough time being at work by 9:00. If I want to get there earlier, I have to be at the ferry dock at 6:50, which is really early for a lot of people. I think adding a 7:30 run in between there would be a great idea. I also wonder how many people will take the ferry at 5:40. In the evening, you have a similar problem. 5:15 is again fine if you work downtown (and clock out 5:00) but even then it is cutting it close. The next ferry is 6:25. Like the 8:00 ferry, I would imagine it will be the most popular. But that is a big gap (over an hour) at the most popular time of day (in contrast, the Vallejo ferry runs every half hour during rush hour). Other than that — which will hopefully sort itself out over time — I think this will be very popular. No, it isn’t as roomy or as breezy as a regular ferry, but it still fun. It is a bit thrilling to go so fast so close to the water. When the thrill wears off, you still have more space than a typical train or bus, and often a more scenic ride. But the main advantage, of course, is the half hour travel time. That really is outstanding for a suburb. In contrast, getting from Federal Way to downtown will take over 40 minutes. The Federal Way train will connect to other transit better, but the ten minute difference more than makes up for that. Link will run a lot more often, but if they add a few more ferry runs, the difference won’t matter very much. Commuter ferries and commuter rail are quite similar, in that they don’t need to run very often to be very successful. Every half hour is usually adequate. One can argue that the previous foot ferries never had a chance to grow ridership because they were shut down after a couple years by external factors, and Bremerton didn’t have the density it’s about to get. 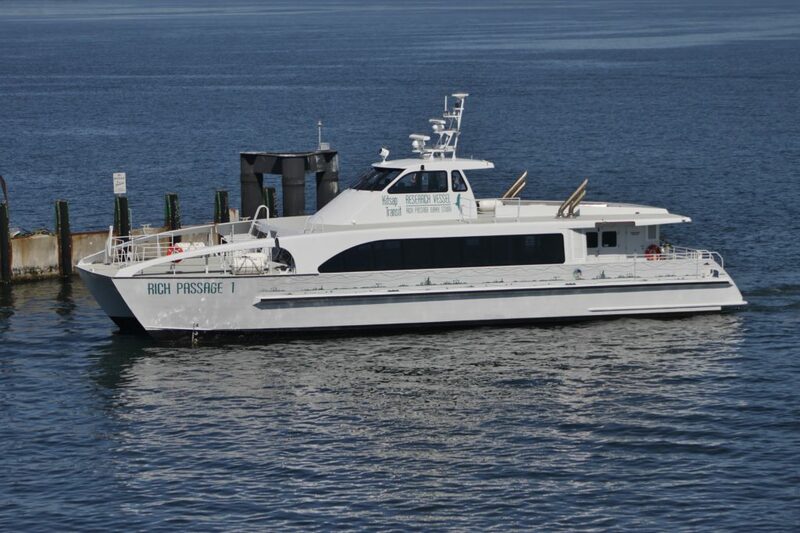 The per-passenger subsidy will still be high, but west sounders seem to put high priority on paying for ferries, like Snohomans do on express buses to Seattle. So maybe it will succeed within those limitations. Part of my family lived in Vallejo in the 30s, 40s, and 50s but I’ve never seen it except from Greyhound. The ferries preceded the Bay Bridge, and now they’re kept on because people like the view and relaxing atmosphere. I don’t know how easy it is to take a bus from Vallejo to BART; I wouldn’t assume it’s fast or frequent or that people do it. It sounds like taking a bus from Monroe to Everett to take Link to Seattle. I don’t know either, but they do run the bus from Vallejo to El Cerritto del Norte every 15 minutes from 4:45 AM to 9:45 PM, so that suggests it is fairly popular. But so too is the ferry — they added some runs a little while ago. What they cancelled was the express bus straight into the city — it just wasn’t worth it. The combination makes sense to me. If you want to go to Oakland, Berkeley (or anywhere else on East Bay) or you don’t want to wait for the next ferry, just take the bus and then take BART. If you want to go right into the city (and know how to time it) then take the ferry. Since commuters are a key uses for such a long trip and commuters are OK with timing a trip, I can see why the ferry is popular. I’m sure they’ll continually poll riders as they roll this out; it will be interesting to see if they add an earlier run – a 6.45am departure should be plenty early? Once East Link opens, commuting to Bellevue/Redmond via the ferries (or Sounder) becomes much, much easier. But for now, the +40 minutes it takes 550 to get into Seattle at peak is tough, and it has poor reliability if you are trying to catch an infrequent transfer. Now that the HOV lanes are both directions, isn’t a bit faster getting to Bellevue? I guess I’m not much of an early bird, but 5:40 seems crazy early. 6:50 is reasonable, but for a lot of people, that means leaving the house before 6:30, which again just seems early. 8:00, on the other hand,is fine, except for the issue I mentioned, even in a few years. Get downtown at 8:00, ten minutes later you are on the train to Bellevue, which means you get off the train right at 9:00. You will be late for your 9:00 meeting, even if work is very close to the station. A 7:30 boat solves this problem — you can get to most employers easily before 9:00, while leaving your house after 7:00. For the return the 5:50 sounds pretty good. Again, most people should be able to get there, even if they clock out at 5:00. Something around 5:00 will probably be added, along with a later ferry is my guess, but none of those seem like they are essential as a 7:30 AM boat. HOV lanes definitely make it better, but you are still dealing with traffic getting in & out of Bellevue, especially if you are leaving right at peak. East Link is only 20 minutes between Seattle and Bellevue, I think? If your boat docks at 8am, you should be at your building in Bellevue well before 9. As for departure times, can’t have a 7.30 boat unless you move the other times around, or add another boat. 30 minutes each way means 1 hr & 10 minutes between departures. Lots of people – especially with long commutes and/or kids at home, work hours like 7-3. Hours like that are pretty standard for construction or shift work, I believe. If you need to be at work at 7, you’ll take the 5.40. There’s a mass that gets off the state ferry around 6 am, and they will have been on the boat for an hour. 5:40 will be a late departure for them. @AJ — OK, the ferry ride is 28 minutes. From the ferry to the closest Link station (Pioneer Square) is at least 9 minutes (https://goo.gl/maps/jPxGnxYqnE92). The train takes 21 minutes to get to downtown Bellevue (http://stb-wp.s3.amazonaws.com/wp-content/uploads/2015/08/14151500/Screen-Shot-2015-08-14-at-8.12.45-AM.png). Then there is the time spent getting to the very deep Pioneer Square Station as well as the time spent waiting for the train, which if you are very lucky, is 2 minutes total. So now the train arrives right at 9:00 AM in Bellevue. But you still need to get to your office. That’s not a bad start time, but it is definitely after 9:00 AM. My guess is the typical Bellevue worker would arrive somewhere from about 9:05 to 9:15 every day (assuming their office is close to the station). Not a big deal for some businesses, but simply unacceptable for others. Good point about adding a 7:30 ferry. I think this is a starter line, and they will eventually add more boats. It will cost more money (unless they give up on Kingston, which is likely to be way less popular) but worth it. My guess is they will also get bigger boats if possible. The ferries serving Vallejo have about 300 seats, or almost three times as many as these boats. I guess the newest one (M/V Solano) was built in Anacortes. Took a ride from Bremerton to Seattle this afternoon on the 3:25 sailing. Stiflingly hot inside and we were told that we had to stay in our seats. No doors open for air. Reservations/ticketing/boarding pass procedures were clearly learnt from Amtrak/WASHDoT Cascades procedures. Bikes severely restricted in both numbers and styles. Ran like a bat-out-of-hell in Rich Passage – so the Scientists we were told about by the Kitsap Transit rep clearly had done their work. But since were were not allowed outside, we could not see the wake for ourselves. UNDERwhelmed. Summer is one thing. Traversing rich passage in the dark and fog of winter at 38 knots in a small boat is a terrifying proposition to me. And slowing the boat will generate a wake, and eliminate time savings. Will be interesting to see. I don’t know why they make you stay in your seat. The Vallejo ferry I’ve taken (a very similar ferry) is all inside, but at least they allow you to get up and go to the bathroom or wander around if you want. Forcing you to sit down the whole time just seems like a silly restriction.